Conventional methods for producing test norms are often plagued with “jumps” or “gaps” (i.e., discontinuities) in norm tables and low confidence for assessing extreme scores. 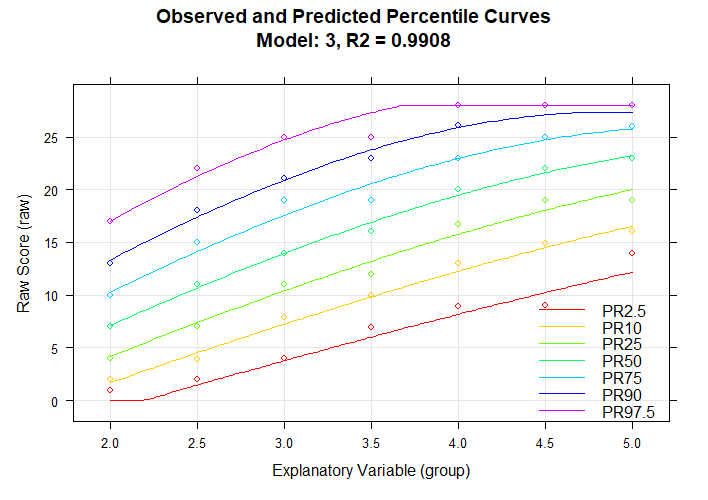 cNORM addresses these problems and also has the added advantage of not requiring assumptions about the distribution of the raw data: The standard scores are established from raw data by modeling the latter ones as a function of both percentile scores and an explanatory variable (e.g., age) through Taylor polynomials. The method minimizes bias arising from sampling and measurement error, while handling marked deviations from normality – such as are commonplace in clinical samples. Contrary to parametric approaches, it does not rely on distribution assumptions of the initial norm data and is thus a very robust approach in generating norm tables. cNORM offers functions for all of these steps, helps in selecting the best fitting models and in generating the norm tables. please use cNORM on the console. number of predictors up to 14 predictors. Cross validation of number of terms with 20% of the data for validation and 80% training. In this case, the group variable has to be set to FALSE when ranking the data. In this example, a Taylor polynomial with power k = 4 was computed in order to model a sample of the ELFE 1-6 reading comprehension test (sentence completion task; W. Lenhard & Schneider, 2006). In the plot, you can see the share of variance explained by the different models (with progressing number of predictors). Adjusted R2, Mallow’s Cp (an AIC like measure) and BIC is used (BIC is available through the option type = 2). The predefined adjusted R2 value of .99 is already reached with the third model and afterwards we only get minor improvements in adjusted R2. On the other hand, Cp rapidly declines afterwards, so model 3 seems to be a good candidate in terms of the relative information content per predictor and the captured information (adjusted R2). 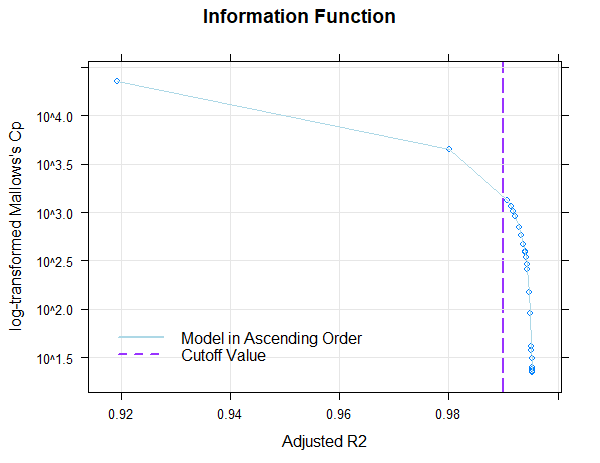 It is advisable to choose a model at the “elbow” in order to avoid over-fitting, but the solution should be tested for violations of model assumptions and the progression of the percentiles should be inspected visually, as well. The package includes data from two large test norming projects, namely ELFE 1-6 (Lenhard & Schneider, 2006) and German adaption of the PPVT4 (A. Lenhard, Lenhard, Suggate & Seegerer, 2015), which can be used to run the analysis. Furthermore, large samples from the Center of Disease Control (CDC) on growth curves in childhood and adolescence (for computing Body Mass Index ‘BMI’ curves), life expectancy at birth and mortality per country from 1960 to 2017 (available from The World Bank). Type ?elfe, ?ppvt, ?CDC, ?mortality or ?life to display information on the data sets.